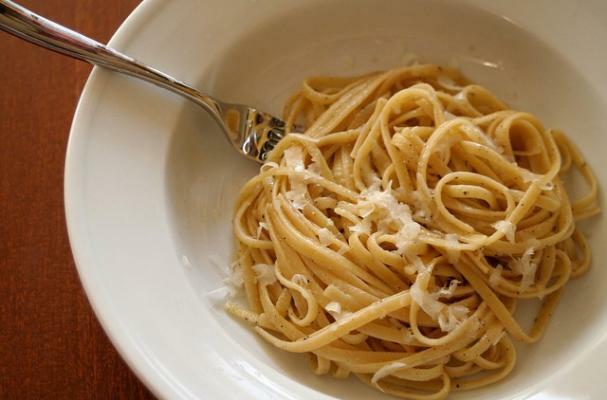 Cacio e pepe or pasta with Parmesan and pepper is a super simple dish that only takes minutes to make. Since this recipe only consists of a couple of ingredients, you want to use the best you can find. With the use of superb ingredients, the dish speaks for itself. The key to cacio e pepe is the reserved pasta water. The water contains starch which helps the sauce stick to the pasta. Serve this delicious pasta dish with a winter green salad and you've got dinner. In a bowl, combine the pepper and the oil; set aside. Cook pasta to nearly al dente (a few minutes less than package directions). Right before the pasta is finished cooking, reserve a few ladles of the hot, starchy water to help emulsify the cheese and oil, and add a little to the pepper and oil mixture (not all of it–little by little as needed). In the pasta pot add the cheese, oil and pepper and toss to coat–if you need to add more water to thin the cheese out a little, add it here. When cheese, pepper and oil have all been evenly distributed serve on plates or bowls and eat. I like cacioe pepe very much. Thanks a lot.